Medaly represents a new dimension in breeding excellence for Maplewood Farms. She was purchased specifically to be bred to Erykk MF for 2009. Their foal, Danskk MF, is a gifted performance gelding. Now retired, Medaly is a lesson in the blending of Polish lines. She is one of three Medalion daughters we used, based largely on research that has proven his strength as a broodmare sire. Medalion contributed a fantastic length of neck – extremely upright – and with extreme flexion at the poll. Medaly’s motion is unparalleled, with all of the power, impulsion and elevation of her sire, a stallion regarded for his ability to produce National winners in halter and English divisions. 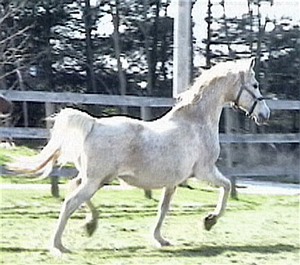 Most notably, his daughter Equitie produced Allionce+/, a show horse of extreme merit, having garnered wins such as U.S. Reserve National Champion Futurity Colt, twice U.S. Reserve National Champion English Pleasure Junior Horse, Canadian National Champion English Pleasure Junior Horse, and U.S. National Champion Informal Combination. Medaly’s dam *Dunkierka was bred by Michalow State Stud in Poland, and is the dam of Halter Champion Palas son *Lech. *Dunkierka carries two lines to Nabor, an important contributor of class and beauty, and is line-bred to Forta, through her son Czort and daughter Dyska (both by Wielki Szlem). The various lines to Wielki Szlem in her pedigree gave us additional confidence in her ability to produce top-notch English horses. Her son Danskk MF brings an additional line to Forta – a mare of extreme athleticism – as well as Nabor and Negatraz, to reinforce classic beauty. This entry was posted in Heritage and tagged mare on October 15, 2013 by Anita Enander.